Singers entertained the people who live at the Grigg Home for the Aged. 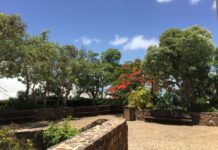 Students of the Juanita Gardine Elementary School (JGES) are incorporating caring for others as part of the school’s overall learning and recovery process following the 2017 storms. 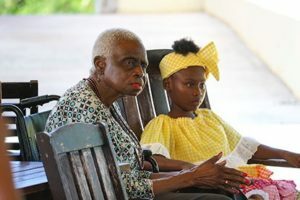 A group of about 21 students performed on Wednesday, May 30, in the courtyard at the Herbert Grigg Home for the Aged, surrounded by residents and staff. They were joined by preschoolers who attend a nearby Head Start program. Gardine students perform at Grigg Home. 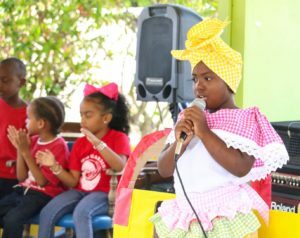 The team of talented students are called the Juanita Gardine Elementary School (JGES) Culture Bearers, according to Assistant Principal Ann Marie Gordon. They pooled their talents to put on a first-class act for audience members with dance, song, poetry and drama and all performances were woven together with a cultural theme. First, the JGES Quadrille Dancers performed several popular numbers, setting the atmosphere for the joyous occasion that followed: A song, “Clear de Road,” was sung by 3rd grader Kioni Leon; a poem, “Turtles,” was recited by 3rd grader Adejeah Hamilton; there was storytelling, “Huss,” told by kindergartner Jahkim Williams; a skit, “Cultural Bus Tour,” performed by kindergarten students Cetoute Williams, Shayla Ayala and Anaiyah Burroughs; a poem, “I Love My Islands,” recited by 4th grader Mellissa Knight; storytelling, “Anansi at the Tug of War,” told by 6th grader Tyashte Jackson; a poem, “I Sing of,” recited by 6th grader Ameer Norman; and a song, “We Will Rise,” sung by 4th grader Jahnyah Greenidge. The JGES Quadrille Dancers closed the program with a final dance selection. 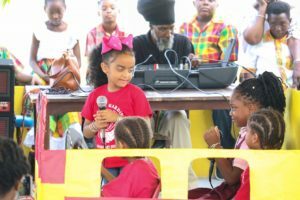 “Our students were cultural bearers showcasing their cultural gifts and talents to bring joy to the residents of the Herbert Grigg Home in honor of Senior Citizens Month,” the assistant principal said. Pat Browne, a retired Gardine computer teacher and now a quadrille advisor, was the caller for the outstanding performance by the student dancers. 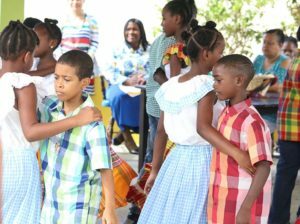 The program was the first of many planned performances by Gardine School students at Grigg Home, which the school has adopted.